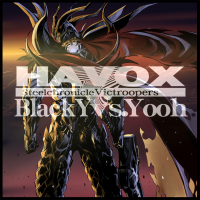 The full version of HAVOX appears in Steel Chronicle VICTROOPERS. HAVOX is a song part of the POLICY BREAK event. 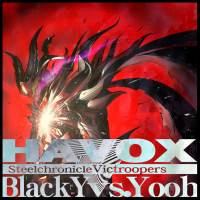 You need to play 10 briefing missions in Steel Chronicle VICTROOPERS (スティールクロニクル ヴィクトルーパーズ) to unlock HAVOX in the SOUND VOLTEX series. For more information on the dates it can be unlocked in the SOUND VOLTEX series, please see the event page. Since April 26th, 2018, it can be purchased in SOUND VOLTEX IV HEAVENLY HAVEN with BLOCKs instead. 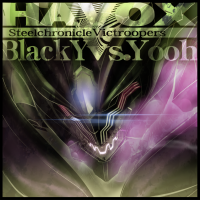 HAVOX is a boss theme for the KONAMI game Steel Chronicle VICTROOPERS' Ver3.9 update. It is played during the battle against ISLX-003Σ. It is the second POLICY BREAK song that did not originate in a BEMANI game, after INSECTICIDE. The conditions required to fight the boss involves playing SKILL ANALYZER in SOUND VOLTEX. HAVOX is the first KONAMI original song made by BlackY and Yooh. According to Yooh, HAVOX is read as "havoc". HAVOX has the longest Max Chain of any EXHAUST chart in the SOUND VOLTEX series, at 2808. This page was last edited on 3 March 2019, at 17:09.